The King of Ragtime by Larry Karp, a Mysterious Review. Review: The King of Ragtime is Larry Karp's second mystery to feature legendary musician and composer Scott Joplin. The book takes place in 1916, just a year before his death. One of America's greatest songwriters, Irving Berlin, is being accused of stealing music brought to him for review. The accuser: Scott Joplin. And this isn't the first time. Five years earlier when Berlin's Alexander's Ragtime Band was released, Joplin swore he had written the music, submitting it to Berlin for possible publication. Joplin said that Berlin had told him it was no good, but then published it under his own name. Though this could not be proven, many in the music world thought it could possibly be true. Now Joplin is sick and dying. He has written If, a musical drama for the theatre. He wants Berlin to once again review and give it consideration for publication of his work. When he takes the work to Berlin's office, an argument ensues and Scott storms out forgetting his music. When he returns minutes later to retrieve his composition, he finds not only is his music and Berlin gone, but a young man in Berlin's outer office dead, his throat cut. Afraid Joplin will be accused of the murder, he is forced by his friends into hiding. Joplin's friends and former associates come to Tin Pan Alley to help untangle the web of mystery: the disappearance of Scott's composition, Berlin's denial that Joplin gave him the music, and the death of an innocent boy. In The King of Ragtime, the author writes, "There are people who don't read fiction because ‘that's just made up stuff. It's not for real. It never happened. It's not true.' But truth has a broader compass than reality. A truth may come into clearer focus when viewed through a fictional lens." In this fictional account featuring real people, where do fiction and reality come together and where do they go their separate ways? Scott Joplin, a well-known black musician, wants very badly to write what he thinks white people will accept. He's highly regarded for his jazz, but he wants to write a musical for the stage, or possibly an opera that will be heard by a wider audience than he enjoys in local bars and jazz hangouts. But towards the end of his life, his illness affects how he acts and what he says. He doesn't realize he may not be able to compose his music, and write his lyrics, as well as he could or should. 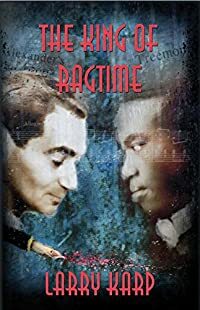 The King of Ragtime is an impressive account of the composer's final months, the murder mystery made all the more real by the recognizable names associated with it. Special thanks to guest reviewer Betty of The Betz Review for contributing her review of The King of Ragtime. Acknowledgment: Poisoned Pen Press provided an ARC of The King of Ragtime for this review.